Overall Dimensions: 950 mm Height x 150 mm dia. The bollard is reinforced with 4 Not 8 mm dia 950 mm long for steel bars, 4 Nos. 12 mm dia 450 mm long for steel bards Et 4 Nos 4 mm dia stirrups at 150mm c/c. 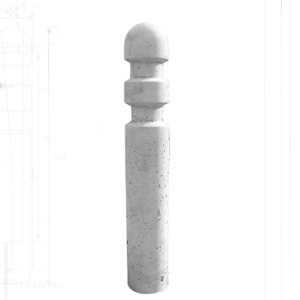 The bollard is manufactured with cement concrete of M-30 grade by vibro compaction method using FRP/steel moulds, so as to achieve shuttering finish.